The Stonefield Lodge playset from Selwood is a pretty children’s play frame with stone wall detailing on the outside of the play fort. 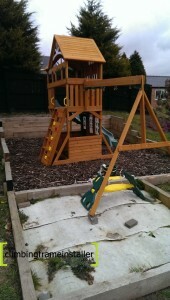 The Stonefield Lodge climbing frame features a wooden play tower with an upper and lower playhouse for children to play in. 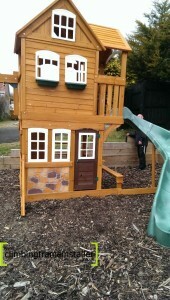 The play fort is even sheltered by a wooden roof which covers the playhouse and balcony area which children can climb to. The raised play house is supported by a wooden deck which is approximately 1.5m from the ground, which children can climb to using either the rockwall or the step ladder at the back of the playset. The play tower includes fantastic detailing such as windows in the front of the playhouse and even window boxes which add to the character of this climbing frame. The playhouse is enclosed around the edges to keep little ones safe while playing, and the additional balcony area which makes the play deck even more spacious for kids, is railed around the outside also. 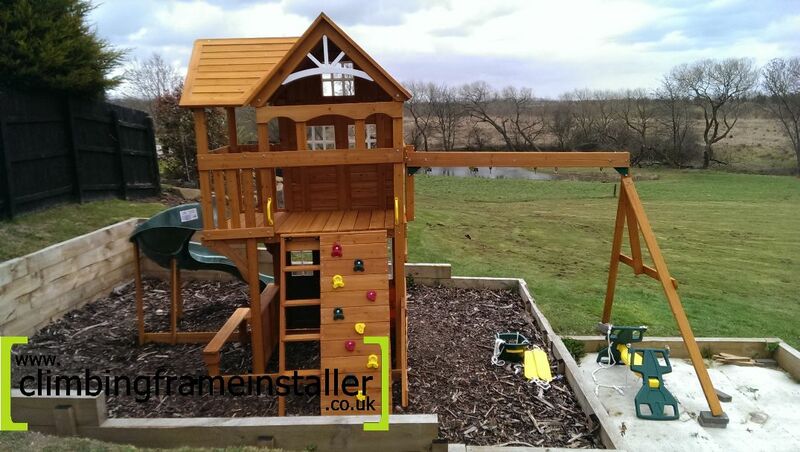 The lower play cabin beneath the play deck is also enclosed around the front and side which provides kids with a well sheltered play den to keep other outdoor toys in etc. The lower playhouse features the stone wall detailing on the front as well as windows and a door for children to use to get in and out of the lower playhouse. 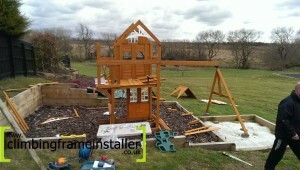 The lower part of the play tower even includes a picnic table and bench to the side of the play cabin, nearest the slide. The picnic area is a handy accessory as it provides a sheltered place for kids to sit and have a drink or a snack between play and can even provide a setting for games such as cafes and restaurants as well as shops and so on. The Stonefield Lodge climbi ng frame includes a curved slide at one side of the play fort. The curved slide helps to save space in gardens as it takes up less room than a straight slide. 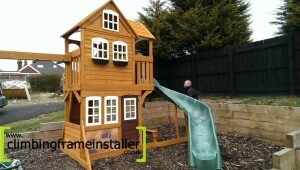 The slide provides a fun way for kids to exit the play deck and it is always a very popular c limbing frame accessory. The curved slide is featured in a few climbing frames in the Selwood range, including the Audley play frame, the Audley Deluxe, the Ickworth and of course the Stonefield Lodge. Lastly, the Stonefield Lodge playset includes a three position swing beam which features a two seater glider swing as well as two single belt swings. The glider is a brilliant way of encouraging children to play together and work as a pair to swing the glider. The single belt swings are fun and safely designed to flex around children’s hip s to help keep them safely balanced on the swing seat while playing. Outdoor climbing frames are a fantastic way of encouraging kids to play in the garden and stay fit and active at the same time as having hours of fun. Children’s play frames are a great way of keeping boredom at bay but they can also make amazing gifts for kids’ birthdays or Christmas time so get yours now before its too late. 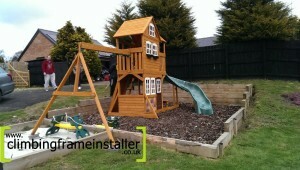 For help with installing your climbing frame, contact the climbing frame installers now. 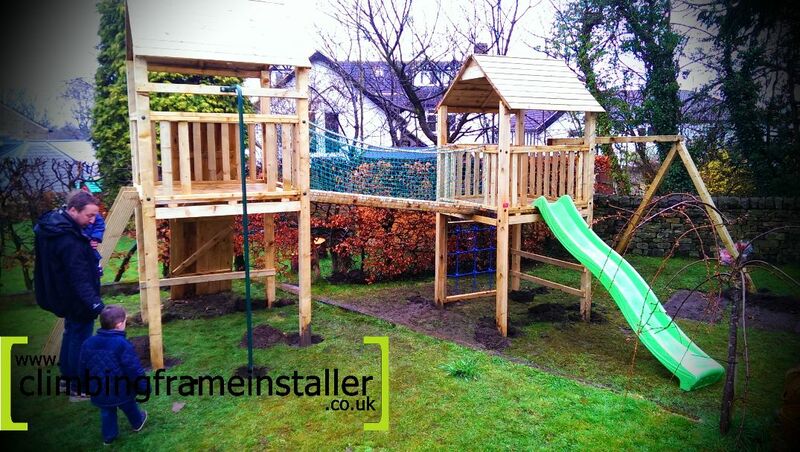 Our certified team of playset builders have over ten years’ experience in the safe construction and installation of outdoor play frames so will ensure yours is quickly and safely installed. For a quote please call us on 07792309588 or email: [email protected].